You did it! 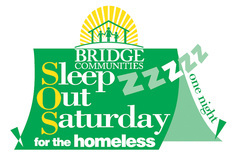 Eighteen teens and nine adults slept overnight on November 3 to raise awareness and funds for Bridge Communities. A special thanks to the adults who stayed overnight and those who helped by cooking, serving, and cleaning up--we couldn’t do it without you! The group spent time in service to our community by deep cleaning the church and loading the St. Vincent de Paul truck with donated clothing. We then enjoyed a dinner of homemade soup prepared by Jane Truchan, bread and hot chocolate, and we followed it with the Luminary Rosary. Several of the adults stayed up all night to guard the campground, while others slept on the hard concrete floor or in cardboard boxes or tents! With the help of our most generous parishioners, we were able to make a donation of $2,840.41! Please know that your donations as well as your thoughts and prayers were greatly appreciated by the teens and families who participated in this event. St. Philip’s parishioners are by far the most loving and supportive family and friends in all ways! On behalf of all of the Sleep Out Saturday participants--and those who will benefit from our donation, a heartfelt thank you! If you missed seeing us, you can still make a donation to this worthy cause by visiting www.bridgecommunities.org/group83. Below are pictures from the 2018 Sleep Out Saturday... Follow this Youtube link to see a Sleep Out Saturday promotional video featuring St. Philip staff and parishioners!